Please fill out and send the form below to receive your License Code. I purchased the product, but I don't have the receipt. How do I register my Ciclo software? Start Ciclo Software. On Windows Vista / 7 / 8 / 10 run as administrator. Please refer to the picture below. Click the [Register] button on the main window. Or click the Help menu and choose Register. The Register dialog box will open. Please refer to the picture below. 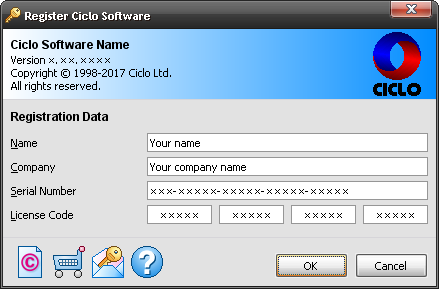 Enter your Name, your Company name and your License Code exactly as it appears on email you received from Ciclo after your purchase. Click [OK] button. You should now be registered. I have purchased a software product but I have not yet received my License Code. What should I do? Please make sure that you have completed your purchase process and have received your Transaction ID from PayPal. Please also make sure that our email containing your License Code is not being blocked by your spam filters. If you have not provided your product Serial Number during the purchase process, please use our Licensing Form to request your License Code. If you have placed your order during our business hours, you will probably receive your License Code within one hour. However, if you don't receive our email within one business day, please contact our Technical Support directly by telephone, online chat or by calling free via VoIP. I lost my License Code. What can I do? If you have lost your original License Code, please use our Licensing Form to request a code copy. If you have a new email address, in the [Note] field of this form, provide the email address you used when you purchased your Ciclo product. Please also provide any additional information that you feel may be relevant. If you purchase one standalone license, you can register the software on one computer. For more information, please see the End User License Agreement (EULA) that accompanies or is included with the software product. However, your standalone license can be used to enable multiple users on one computer. If you want to use a Ciclo product on multiple computers, please contact us for a discounted rate. Click the Help menu and choose About. The About dialog box will open, allowing you to verify your registration data.